Small enough to work on even the smallest pumps! The Mighty Vac is truly the cleaner that is strong enough to work on even the smallest pumps in the industry. We have designed the Mighty Vac to be the solution to all of your vacuuming needs for your Intex® brand swimming pool. The Mighty Vac is designed to operate on 16-45 gallons per minute meaning it will work on your 1,000, 1,500 and 2,500 gallon per hour pool pumps. Also this cleaner works well on the popular equipment upgrade kits offered by Game, Waterway and Hayward. 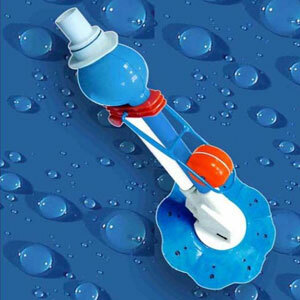 All you need to install your Mighty Vac is the Intex® skimmer kit. Simply remove your pool skimmer and the Mighty Vac will hook up in minutes and start operating when your pool is circulating. TAKE A LOOK AT THE MIGHTY VAC OPERATING ON AN 1,000 GPH POOL PUMP BELOW!